My how things have changed since 1980, when this book was first published, and it’s not that our choices now include women or poor people or consistently people of color. But back to voting in a minute. My route to work now includes the 7, though only briefly, but that was enough to have an interesting exchange with a black World War 11-era veteran (yes, the guy was in his 90s; I had to ask a few times since he looked about 65). “Hey, I read that book,” he said in a beautiful, James-Earl-Jones deep voice. “Oh, yeah?” I peeked over the top of it to get a sense of how this might go. He was smiling and clutching a splotchy rainbow-colored umbrella. So far so good. “Yeah. Didn’t really need to, though, since I lived through about half of it and the rest is in my bones.” I see the start of a raised scar on his forearm that disappears under his banana-yellow polo sleeve, the flesh so pink it might have bubbled up yesterday. Which is how Zinn made the past 400 years feel to me, though maybe that’s because this book makes it sharply clear that what’s horrifying, or what should be horrifying, about the present times is not that they are, as is repeated ad nauseam in the media, “not normal” but that, in fact, they are. As he explicates the ceaseless vortex of atrocities those in power on this land have been committing even before the US was a country, Zinn’s prose is spare, like he’s sparring with you but over marmalade and microfiche. Still, the details in his reportage, which he lets scream for themselves, are overwhelming. And that’s as it should be. “Now why would someone go and do such a thing, Missy?” It’s not really a question but I answer it like it is. I barely manage to say “Blessed day, sir” and turn around before I’ve got tears steaming on my face. It’s so rare these days – and so precious, evidently – to have a disagreement with someone and not get the emotional snot beaten out of you but rather, to end in a genuinely positive space. Blessed day, indeed. It’s also rare (and thus refreshing) these days when people acknowledge their shortcomings and bear their biases clearly. 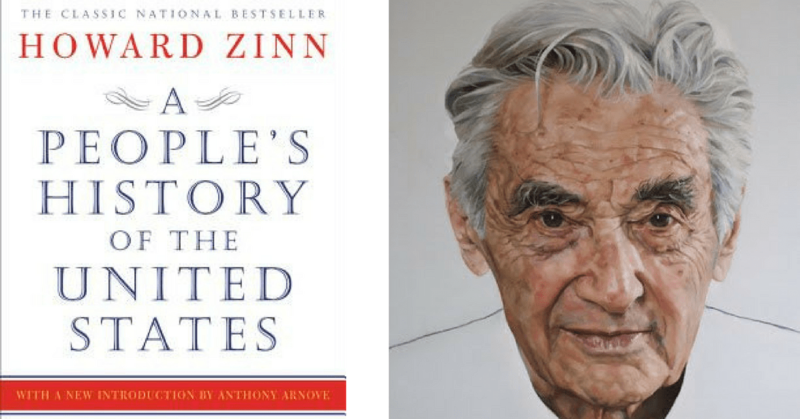 Zinn does both – he apologetically admits he did not cover the LGBTQ movement in the detail it deserves and seems conscious of the fact that women get two, maybe three chapters’ worth of concerted attention in a near-700-page work – so I hate to complain. But there is another issue he leaves out almost entirely, and it’s imperative to mention, at the risk of ruining the blessedness: that of disability, particularly mental illness and the struggle of those who suffer mental and emotional distress for justice. Mass injustice – involuntary drugging; incarceration (it still feels like prison even if it’s a hospital if it’s against your will), electro-convulsive therapy (on which there is finally a moratorium only because of the lawsuit against the manufacturers of the device that administers the shock, due to the research that demonstrates the “treatment” causes brain damage); systematic discrimination in the workforce; isolation and abandonment (more engagements than I can count have been broken off after a mental-health diagnosis, and those are just the ones I know personally); persistent and damning stigma – has been perpetrated against people with disabilities and mental illness by the government and the public alike. Just because there haven’t been protests doesn’t mean there isn’t a movement – a people’s movement that deserves a central place in the historical record, especially one that claims to be counter to the usual perspectives from which the story is told. It will be more than a blessed day when not just a renowned historian but the average citizen knows who E.D. Roberts and Roland Johnson are, or at least when you start typing “leaders in the ________”, Google will actually suggest “psychiatric survivor movement” or “mental-health movement” as real options.